And a race to find literary gold. On the eve of the Globe’s production of Hamlet, Shakespeare scholar and theater director Kate Stanley’s eccentric mentor, Rosalind Howard, gives her a mysterious golden box, claiming to have made a groundbreaking discovery. Before she can reveal it to Kate, the Globe burns to the ground and Roz is found dead — murdered in the strange manner of Hamlet’s father. Inside the box Kate finds the first piece in a Shakespearean puzzle, setting her on a deadly, high-stakes treasure hunt. One of “10 fiction titles you won’t want to miss” this fall. From the river, it looked as if two suns were setting over London. One was sinking in the west, streaming ribbons of glory in pink and melon and gold. It was the second sun, though, that had conjured an unruly flotilla of boats and barges, skiffs and wherries, onto the dark surface of the Thames: Across from the broken tower of St. Paul’s, a sullen orange sphere looked to have missed the horizon altogether and rammed itself into the southern bank. Hunkering down amid the taverns and brothels of Southwark, it spiked vicious blades of flame at the night. It wasn’t, of course, another sun, though men who fancied themselves poets sent that conceit rippling from boat to boat. It was – or had been – a building. The most famous of London’s famed theaters – the hollow wooden O, round seat of the city’s dreams, the great Globe itself – was burning. And all of London had turned out on the water to watch. The earl of Suffolk included. “Upon Sodom and Gomorrah, the Lord rained down fire from heaven,” purred the earl, gazing south from the floating palace of his private barge. In his office of lord chamberlain of England, Suffolk ran the king’s court. Such a disaster befalling the King’s Men – His Majesty’s own beloved company of actors who not only played at the Globe when they weren’t playing at court, but who owned the place – might have been expected to disturb him. To scuff, at the very least, the sheen of his pleasure. But the two men sitting with him beneath the silken awning gave no sign of surprise as they sipped wine, contemplating the catastrophe. Their silence left Suffolk unsatisfied. “Gorgeous, isn’t it?” he prompted. “Gaudy,” snapped his white-haired uncle, the earl of Northampton, still lean and elegant in his mid-seventies. The man cleared his throat softly. His voice, like the rest of his clothing and even his eyes was of an indeterminate hue between gray and black. “It began, my lord, when the players’ gunner took sick unexpected this morning. His substitute seems to have loaded the cannon with loose wadding. One might even suspect it had been soaked in pitch.” His mouth curved in what might have been a sly smile. “Go on,” said Northampton with a wave. “Burned. Not badly. But spectacularly. From my perch – a fine one, if I may say so – I saw him take control of the scene, organizing the retreat from the building. Just when it seemed everyone had got out, a young girl appeared at an upper window. A pretty thing, with wild dark hair and mad eyes. A witch child, if ever I saw one. Nothing visibly altered in Northampton’s face; all the same, he radiated dark satisfaction. “It’s the Globe that matters,” fretted Suffolk. Across the water, a great roar shot skyward. What was left of the building imploded, collapsing into a pile of ash and glimmering embers. A sudden hot gust eddied across the water, swirling with a black snowfall of soot. 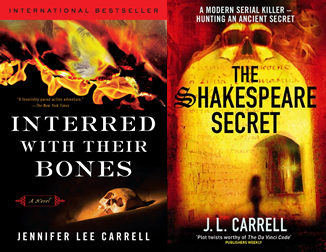 —Reprinted from Interred With Their Bones by Jennifer Lee Carrell By permission of Plume, a division of Penguin Group (USA) Inc. Copyright © 2007 by Jennifer Lee Carrell. All rights reserved. This excerpt, or any parts thereof, may not be reproduced without permission. We are all haunted. Not by unexplained rappings or spectral auras, much less headless horsemen and weeping queens — real ghosts pace the battlements of memory, endlessly whispering, Remember me. I began to learn this sitting alone at sunset on a hill high above London. At my feet, Hampstead Heath spilled into the silver-gray sea of the city below. On my knees glimmered a small box wrapped in gold tissue and ribbon. In the last rays of daylight, a pattern of vines and leaves, or maybe moons and stars swam beneath the surface of the paper. Once, she’d been both my mentor and my idol, and then almost a second mother. While she played the matriarch, I’d played the dutiful disciple — until I’d decided to leave academics for the theater three years before. Our relationship had frayed and soured even before I left, but my departure had shorn it asunder. Roz made it clear that she regarded my flight from the ivory tower as a betrayal. Escape was how I thought of it; absconded was the term I’d heard that she favored. But that remained hearsay. In all that time, I’d heard no word of either regret or reconciliation from her, until she’d shown up at the theater without warning that afternoon demanding an audience. Grudgingly, I’d cut a fifteen-minute break from rehearsal. Fifteen minutes more, I told myself, than the woman had any right to expect. I stared at her in disbelief. Was she really asking me to shake the dust of the Globe from my feet and follow her, based on nothing more than a few teasing hints and the faint gravitational pull of a small gold-wrapped box? Rage flared through me; I rose so quickly I knocked several books off the table. Mine? I frowned. Roz had any number of friends in the theater; she would not need to come to me for questions about Shakespeare on the stage. The only other subject she cared about and that I knew better than she did stretched between us like a minefield: my dissertation. I had written on occult Shakespeare. The old meaning of the word occult, I always hastened to add. Not so much darkly magical, as hidden, obscured, secret. In particular, I’d studied the many strange quests, mostly from the nineteenth century, to find secret wisdom encoded in the works of the Bard. Roz had found the topic as quirky and fascinating as I did – or so she had claimed in public. In private, I’d been told, she had torpedoed it, dismissing it as beneath true scholarship. And now she wanted my help? It was an old tease — that in certain moods, I looked like the queen. Not the present Elizabeth, but the first one. Shakespeare’s queen. It wasn’t just my auburn hair and dark eyes that did it, either, but the slight hook in my nose, and fair skin that freckled in the sun. Once or twice, I’d glimpsed it in the mirror myself — but I’d never liked the comparison or its implications. My parents had died when I was fifteen, and I’d gone to live with a great-aunt. Since then, I’d spent much of my life in the company of autocratic older women, and I’d always sworn I would not end up like them. So I liked to think I had little in common with that ruthless Tudor queen, save intelligence, maybe, and a delight with Shakespeare. A little awkwardly, Roz lowered her hand. I think she couldn’t quite believe I’d given in so easily. Neither could I. But my anger was sputtering out. Actors began flocking into the bright glare of the courtyard. Roz smiled and stood. “You must go back to work, and I must simply go.” In a rush of nostalgia, I glimpsed a ghost of the old wit and spark between us. “Keep it safe, Katie,” she’d added with one last nod at the box. Then she’d walked away. Which was how I came to be sitting on a bench up on Parliament Hill at the end of the day, doing what I’d once sworn I’d never do again: waiting for Roz. I stretched and considered the world spread out in the distance. Despite the two fanged towers of Canary Wharf to the east and another set midtown, from this height London looked a gentle place, centered on the dome of St. Paul’s Cathedral like a vast downy nest harboring one luminous egg. In the last hour, a steady trickle of people had passed by on the path below. Not one of them had turned up toward me, though, marching through the grass with anything like Roz’s arrogant step. Where was she? And what could she be hoping for? No one in their right mind could imagine that I’d give up directing Hamlet at the Globe. Not yet thirty, American, and trained first and foremost as a scholar, I figured I was pretty much the toxic negative of whatever the gods of British theater might imagine as ideal clay for fashioning a director. The offer to take on Hamlet — the finest jewel in the British theatrical crown — had seemed a miraculous windfall. So much so, that I’d saved the voice mail from the Globe’s artistic director, spelling it out. I still played his manic, staccato voice back every morning, just to make sure. In that state of mind, I didn’t much care if the box in my lap held a map of Atlantis or the key to the Ark of the Covenant. Surely even Roz at her most self-involved would not expect me to exchange my title of “Master of Play” for whatever mystery, large or small, she’d handed into my keeping. The show opened in three weeks. Ten days after that would come the worst part of life in the theater. As director, I’d have to stop hovering, tear myself from the camaraderie of cast and crew, and slink out, leaving the show to the actors. Unless I’d lined up something else to do. The box sparkled on my knee. Yes, but not yet, I could tell Roz. I’ll open your infernal gift when I’m finished with Hamlet. If, that is, she bothered to show up for any answer at all. I turned back, scanning the scene below. No one was there, but gradually I became aware of movement I had not noticed before. Far below, behind St. Paul’s, a pale column of smoke was spiraling lazily into the sky. My breath caught in my throat. Behind St. Paul’s, on the south bank of the River Thames, sat the newly rebuilt Globe with its walls of white plaster criss-crossed with oak timbers, its roof prickly with flammable thatch. So flammable, in fact, that it had been the first thatched roof allowed in London since the Great Fire of 1666 had burned itself out almost three and a half centuries ago, leaving the city a charred and smoking ruin. Surely the distance was deceptive. The smoke might be rising five miles to the south of the Globe, or a mile to the east. The column thickened, billowing gray and then black. A gust of wind took it up, fanning it out; at its heart winked an ominous flicker of red. Shoving Roz’s gift into the pocket of my jacket, I strode downhill. By the time I reached the path, I was running. Find an interview with suggested discussion questions HERE.